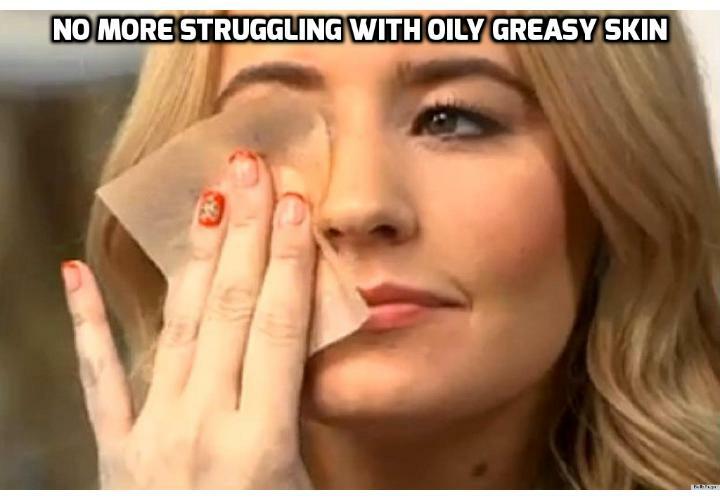 Oily greasy skin can be genetic or caused by a whole host of unexpected factors like stress, medication, overusing certain skincare products or even getting tan. It may need slightly different care that may give you the results you need. Oily skin usually looks greasy, thick, coarse and shiny. It has enlarged pores and tends to break into acne. You can conduct a simple test to find out whether your skin is oily. Wipe your face with a clean facial tissue in the morning when you have just woken up. If your skin is oily, the paper will have spots of facial oil on it corresponding to areas of your cheeks, nose or forehead. Nonetheless, oily greasy skin saves you from early aging and wrinkling of the skin. Think for a moment! Find out do’s and don’ts for oily greasy skin. Here are some. Use a natural water soluble cleanser twice a day to cleanse your face. Your cleanser should contain salicylic acid, glycolic acid or benzoyl peroxide. After a day of work, dust and grime can settle on the skin and sweat can seep this junk into your pores. This also happens from the sweat after a workout clogging the pores. So it’s important to wash your face in the morning, before going to bed and after working up a serious sweat. You may go for Bio element Oil Control Mattifier to soak up excess shine on the surface of your skin while targeting oil sebum deep in your follicles. Use oil-free moisturisers which tend to contain glycerine and other humectants that draw water out onto the skin. You may consider hydrating liquids, gels and sebum. The goal of moisturizing your skin is to hydrate rather than adding oil to it. This may lessen oil production effectively. Tone your skin regularly with an alcohol-free toner loaded with antioxidants and skin-replenishing ingredients. Oily greasy skin tends to have an extra thick coat of built-up dead skin along with thickened pore lining. Gently exfoliating is one of the most important skincare steps for people having oily skin. It may remove build-up grime and diminish clogged pores. Dermatologists recommend sunscreens especially for oily greasy skin. Regular use of sunscreen with SPF 25 is the best way to prevent oily skin from premature aging, wrinkling, pigmentation and loss of natural radiance. Drink plenty of water. You may flavour it up with fresh lemon juice. You may consume unsalted nuts, good quality dark chocolate, berries, avocados, bananas, lean poultry, oily fish, vegan cheese, wholemeal bread, wholemeal pasta, oats, brown rice, home-made soups, almond milk and other foods rich in fibre. Eat in moderation! Try cooking with healthy fats like olive oil. Change your cooking habits by boiling, grilling, baking and poaching. If these do’s don’t work to get the grease under control, see your dermatologist. Don’t use oil blotting sheets of any brand to absorb extra oil. Although some of the oil is absorbed into the paper, you may push the rest of the dirt, grim, makeup and excess oil into your pores. It may create breakouts, blackheads, bumps and overall skin congestion. Don’t over wash your face. It may deprive glands of natural oils that may lead to clogged and enlarged pores. Avoid using any unnecessary skin tools, including oil, blotting paper, blemish extractions, wash cloth, rotating cleanser brushes, buff puffs, pore strips and more. They can only prompt the skin to produce excess oil by stripping the skin of necessary oils. Never use rich creams or greasy ointments. They suffocate the skin with more grease. Harsh scrubs can strip the skin leading to more oil production. Say no to them. Heavy makeup is not meant for people with oily skin. Look for oil-free options when buying cosmetics. You may look on the labels for niacin amide, a B vitamin derivative that has been shown to absorb oil. Failing to wash makeup all off before going to bed can be disastrous for you. It can clog pores very badly. Foods to be avoided: Dairy products, refined carbohydrates, inflammatory fats, sugar, excess of salt, alcohol and aerated drinks. The health and beauty of your skin later in life largely depends on what you eat and how you take care of yourself. Match your skin type with the recommended methods to improve your look and slow the ageing process. Let your skin glow with a dewy dash instead of looking shiny and greasy with large pores. Watch this Video – HOW TO STOP OILY SKIN!!!! Thanks for the great tips here. Will visit your blog again! Keep up the good work and write more skin care tips. I used to have a website that I used to cover this, but it got spammed to death. You seem to be better at weeding out the spam than I did! Don’t give up! Hi! Oh my goodness! an amazing article dude.